The 'Karlization' of global temperature continues – this time RSS makes a massive upwards adjustment | Watts Up With That? They just wanted to know, you know, they wanted to fine-tune their statement about, you know, whether , you know, the surface temperatures are more accurate or the satellite temperatures are more accurate, and initially they wanted to say something like “But you really shouldn’t trust the satellite temperatures, you should go with these surface temperatures”, and I said, “Well, what I would like to emphasize, you’d really want to look at all the different datasets, so you don’t want to trust only the satellite temperatures, you want to look at the surface temperatures, and – and that sort of thing. Mears uses the term “denialist” so there goes his objectivity when he feels the need to label people like that. Clearly, he’s miffed. So what to do? Taking a cue from the other Karl, he publishes a paper and claims that new and improved adjustments have “found” that missing warming. Fig. 9. Comparisons of near-global (80°S to 80°N) and tropical (30°S to 30°N) anomaly time series for TMT datasets produced by different groups. 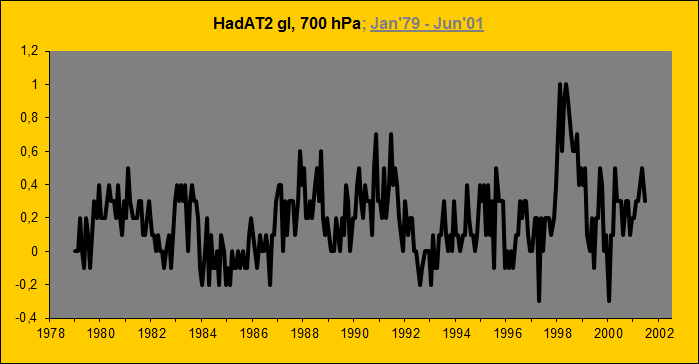 To make differences in trends easier to see, the anomaly time series have been adjusted so that their averages over 1979 are zero. If you think that’s something, for the tropic-30S-30N: the new rate of warming of RSS V4.0 is almost five times larger than UAH’s! The paper is for MT, not LT…but I think we can assume that changes in one will be reflected in the other when Mears completes their analysis. From what little we have looked at so far, it appears that they did not correct for spurious warming in NOAA-14 MSU relative to NOAA-15 AMSU…see their Fig. 7c. They just leave it in. Since this spurious warming is near the middle of the whole time period, this shifts the second half of the satellite record warmer when NOAA-14 MSU (the last in the MSU series) is handed off to NOAA-15 AMSU (the first in the AMSU series). Why do we think NOAA-14 MSU is at fault? 1) AMSU is supposed to have a “Cadillac” calibration design (that’s the term a NASA engineer, Jim Shiue, used when describing to me the AMSU design, which he was involved in). 2) NOAA-14 MSU requires a large correction for the calibrated TB increasing with instrument temperature as the satellite drifts into a different orbit. The NOAA-15 AMSU requires no such correction…and it wasn’t drifting during the period in question anyway. So, it looks like they decided to force good data to match bad data. Sound familiar? Fig. 7. 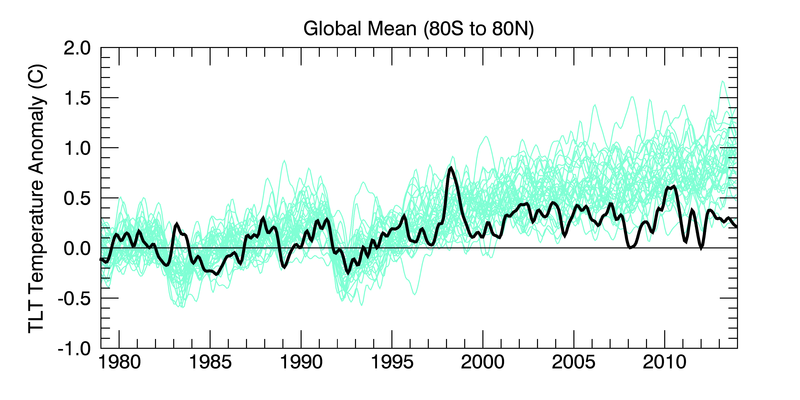 MSU minus AMSU near-global (60°S to 60°N) time series for land, ocean, and 802 combined land and ocean regions. Each panel shows the results after different levels of 803 adjustments are applied to the data. I assume neither you or Christy were asked to review this paper? There aren’t many satellite temperature data experts in the world. John reviewed their original paper submission to JGR, in detail, asking for additional evidence — but not advocating rejection of the paper. The JGR editor ended up rejecting it anyway. Mears & Wentz then revised the paper, submitted it to J. Climate instead, and likely asked that we be excluded as reviewers. March 2, 2016 in Climate data, Hiatus in Global Warming. So if Spencer and Christy are correct, that NOAA-14 is at fault, it seems like this would drop the reported RSS MT v4 trend from 0.125C/dec to 0.106C/dec, or by about 40%. We have only a tiny abstract from a pay walled article on a subject very few people have any experience in-satellites- and which many in the business claim has little relevance to real world temperatures -2 metre above the ground-as very substantial interpretation is required. Hopefully those with genuine expertise will chip in to the debate and provide some context. It’s not NOAA14 at fault. RSS v3.3 did not sit with calibration with RATPAC data since the new AMSU on 15. Self-referencing eh Kristian (and death by graph). So 85 sonde stations suddenly veer warmer at the junction of the MSU > AMSU 14>15 change over. Toneb: You say “anyone can compare RSS v RATPAC.” Yet I am having trouble reproducing your plots. What’s your data source for the RATPAC data properly weighted to directly compare with the MSU MT? An advice to you, Toneb: Look at the DATA presented, not the person presenting it. The data speaks for itself. RATPAC and HadAT2 are both a mess. They are no more a mess than any other data-set. I am sorry Kristian, but your analysis is just a wall of graphs and text. No statististics, and you dont even bother to a make a proper 850-300 mbar index out of HadAT. The difference in trend between RSS (or UAH v6) is not significant before 2000, but it is after. The pattern is confirmed by RICH, Raobcore, and IUKv2. The latter also have a slightly larger trend than the satellites before 2000, but not significantly. The reason for the hadcrut 4 version was because hadcrut3 apparently wasn’t finding the warming in the Arctic. RSS matched hadcrut3 fairly well during both MSU and AMSU before it changed to hadcrut 4. Now RSS changes to match closer to hadcrut4 when the reasons for changes in hadcrut have not been verified by the GPS-RO also below. So has now RSS fabricated the missing warming in the Tropics to match surface data because of a unverified problem not even related to this? The troposphere DOES track the surface. If you only know what surface dataset to use: HadCRUt3. Which agrees remarkably well with the CERES ToA OLR data. RATPAC doesn’t suddenly veer. It didn’t exist prior to 2005. It matches that satellite data so well because it was pegged to the satellite data in development. The moment it went live it started to diverge because it was designed to. NOAA didn’t like what the weather balloons were saying so they rigged a new dataset to show warming. Had to be *the* conspiracy. Like adjusting down is fine, but god forbid they are made upwards. It is not NOAA-15 that it at fault as this data can be used without any corrections to the measurements. It should be noted that the results presented in this study were obtained directly from the NOAA-15 AMSU-A data without any correction to the measurements. This shows that the AMSU-A data from a satellite with LECT ∼0730 and 1930 can be used to derive the climate trends. The paper is entitled (fully)…. So up to 9 years ago. It maybe 9 years ago, but the main issue is regards to changing from MSU and clearly this has not been a problem with it being used here for nearly a decade. I refer you to the quote from Mears et all in the first post here by Chip Knappenberger…..
And a simple look at the RATPAC comparison makes it abundantly clear something “has happened”. What has happened is a small observation project cannot find global trends. These claims from the other inferior products are embarrassing and like wanting to adjust global temperatures to local. How does a limited 85 station network become the standard reference for satellite data that covers ~95% planet? The UK has warmed much less than global temperatures this month with a station network larger than this, so need to adjust GISS to show this less warming? Thing is, that the 1998 El Nino is what actually STOPS the back-calculation. Without that STEP that alarmist have to rely one to show a warming trend, there has been essentially NO WARMING in whole satellite record. Flat before the 1998 El Nino, and flat from after it up to this El Nino. The alarmista are RELYING on these NON-CO2 forced El Ninos to claim warming. So El Ninos step up the temperature but La Ninas don’t step it down? I say more like, the pre-1997 period has its slope depressed by the Pinatubo eruption. El Nino/La Nina, when there is a solid solar input yes.. they can cause a step up. Now what do you think they will do when the solar input is low. 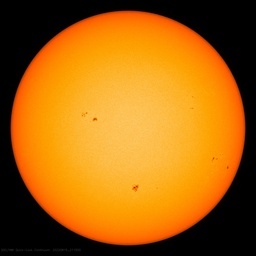 Yes, the debate about how our local star doesn’t control our temperature despite it being the main source of heating here on this planet, will end once the sun decides to do what it did during the Little Ice Age, that is, have few or no sun spots. What I said on the previous thread. Our UAH v6 paper has been already been submitted for possible publication, although it still has to go through peer review. It’s a little awkward to add new, significant material to a manuscript after it’s already submitted, so John Christy and I need to discuss this. But it would be good to see an opinion (added to the presently submitted paper or in a future one) from the UAH team on the new corrections from the RSS team. a little awkward perhaps but surely crucial given the issues raised by Mears and Wentz? Dr Spencer, will Carl Mears or anyone on the RSS team be peer reviewing the UAH v6 adjustments? This is all getting rather messy in my opinion. UAH adjustments decrease the trend in LT, RSS adjustments then increase the trend in MT, especially over the tropics, thereby miraculously finding the missing tropical mid-tropospheric hotspot. From the outside, for the lay-person who doesn’t understand all the intricacies of satellite tropospheric temperature retrieval, it’s coming down more to a matter of whom do we trust more to give an unbiased analysis of satellite data? Mears has demonstrated repeatedly an unscientific bias in favour of endorsing AGW theory. His recent behaviour in that regard falls far short of what one should expect from a scientist who is dispassionately surveying the evidence for and against a significant, perhaps overriding influence of man on climate. He is behaving more like an advocate than a scientist whereas yourself and John Christy have maintained a more balanced approach. So unless Mears can demonstrate an overwhelmingly good scientific case for his positive adjustments vs. the UAH negative adjustments, the balance has to be in favour of giving more credence to UAH data rather than the new ‘pause buster’ RSS data. I read above that you trust NOAA-15 and not NOAA-14 because some NASA scientist have told you that the AMSUs have a “Cadillac calibration”. Is that approach scientific, making important choises based on anecdotes? As a contrast Mears et al consider NOAA-14 and -15 equally right (or wrong). Since we simply don’t know which one is right, I find their approach scientifically sound. But, why not bring it to the test, and validate NOAA-14 and NOAA-15 against radiosondes and see which one is right? As far as I know NOAA-14 follow radiosondes, but NOAA-15 doesn’t. Another way to validate the AMSU-channel 5 is to compare with the neighbour channels 4 and 6. Is it reasonable that the trend of channel 5 is 0.15 C/decade lower than channel 4, and almost as low as channel 7 (Mo 2009)? Is it reasonable that the trend of channel 5 is much lower than a weighted blend of channel 4 and 6 (according to the NOAA Star AMSU-only datataset)? But, why not bring it to the test, and validate NOAA-14 and NOAA-15 against radiosondes and see which one is right? As far as I know NOAA-14 follow radiosondes, but NOAA-15 doesn’t. Why do you automatically think that the radiosondes represent “Troposphere Truth”? That’s a nonsensical assumption. Why would this represent “Troposphere Truth” …? Dr. Spencer is a signatory of the Cornwall Alliance statement on Climate Change, stating that God would not allow us to adversely alter the climate. He has also stated that he views his job as stopping overt government overreach and taxing on climate change mitigation. I’m not criticizing Mears or Spencer either way – but it’s false to suggest that Dr. Spencer has not engaged in explicit advocacy over this issue. So unless Mears can demonstrate an overwhelmingly good scientific case for his positive adjustments vs. the UAH negative adjustments, the balance has to be in favour of giving more credence to UAH data rather than the new ‘pause buster’ RSS data. This is rather ironic Spencer has always stated that the RSS method of correcting for diurnal drift was inferior to the method that he and Christy used, criticizing the approach of using a climate model as the basis for their correction. Now RSS have come around to his way of thinking and developed a new method which is the subject of their new paper. So it’s difficult to argue that over such a time it’s appropriate for UAH to substantially modify their method while at the same time criticizing RSS for a similar change, particular when they drop the previous approach which S&C had always criticized! The interesting part is that both groups appear to be moving away from the TLT product to the TMT. “This is rather ironic Spencer has always stated that the RSS method of correcting for diurnal drift was inferior to the method that he and Christy used, criticizing the approach of using a climate model as the basis for their correction. Now RSS have come around to his way of thinking and developed a new method which is the subject of their new paper. 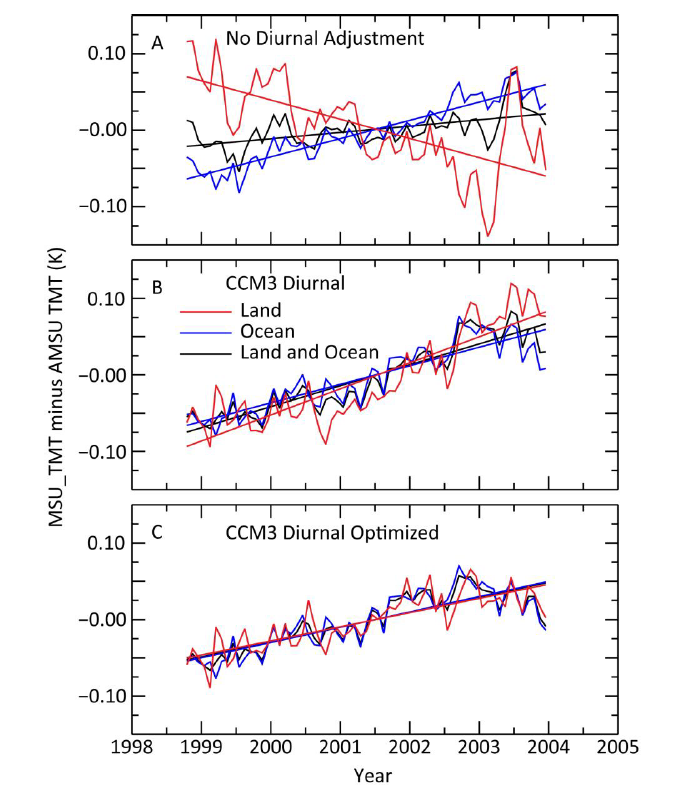 Spencer & Christy devised an empirical method of correcting for diurnal drift, in part driven by a desire to find an alternative to Mears’ corrections based on a climate model. Simply because Mears has now devised an alternative correction for diurnal drift does not mean that it is superior to the previous model-based correction or that it is somehow now ‘in line’ with Spencer & Christy’s empirical method. Most obviously, RSS v4.0 is now less ‘in line’ with UAH than it was before. So whereas the evolution of adjustments to UAH have resulted in a relative modest cooling, the same in RSS have now resulted in significant extra warming. Both datasets might be wrong; either may be more or less correct, but they can’t both be right. Yes, I believe TMT is more straightforward to measure, without having to correct additionally for radiation coming from the surface. Every dataset on the planet shows 2016 as the warmest year ever recorded. UAH, RSS, et al. How can they all be wrong? To start all but one model part or most of the planet based on spotty samples. I’m not sure what ‘one model part’ is but thought RSS & UAH covered nearly the full planet. That does not sound spotty. My understanding of one of the comments is that RSS solves some of its calibration (diurnal? ) with a model, where UAH is empirical. And the surface series are mostly made up of locations that aren’t even measured. Spencer & Christy have responded to Mears v4 adjustments here: https://wordpress.com/read/feeds/867469/posts/946736580. Only 1/3 of the correction is due to the diurnal drift and Mears’ combination of empirical and model adjustment gives a stronger upward correction for diurnal drift than UAH empirical only. Attention, any attention is good, when you are indulging in public relations. So what justification does Mear use, to explain why his measurements need adjusting once more? Could he define his terms? For example what does “denialist” mean? As the good doctor uses it? Why would a scientist take it personally how other persons use his interpretations of satellite data? This strange mixture of advocacy and science seems to serve neither. Now I may just be blind, but what is the zero average temperature for these anomalies ?What period? And what are the error bars? Because if these “measurements” need adjusted once more, surely the pass error estimations must have been underestimated. His open insult calling people who have other ideas, ‘denialists’ is pure evil and totally due to politics, not science and he is totally wrong to use this term and should apologize and resign. RSS probably got tired of dealing with complaints from it’s funding sources. Why else “correct” to match known bad data? I suspect you are correct. It happens all the time in behavioral surveys, where biased measures, oversampling and sloppy weighting practices are used to make outcomes look better than they really are. For example, a website might have an audience of 1,000,000 on a clean survey, and an audience of 1,500,000 on a biased survey. If you’re selling ad audience which number do you want to pay for? The problem is that it always comes back to bite them in the arse in the long run. So what do the Radiosondes say? In a prior post here it was raised that water vapor rises by 7% per degree of warming. Sort of like an internal calibration check. if the water vapor level doesn’t match they have a problem !! Sigh! Here we go again. Caramelizing is a part of many recipes that sometimes end in disaster. Why not use it to Cook data? In the same vein as changing the good data to match the bad data, perhaps the climate scientists never correlate their models to match measured data because they know eventually the measured data will be adjusted to match the predicted data. As any fool can see the data trend was wrong, nudge nudge wink wink say no more, and naturally has underestimated the warming as usual. With so many adjustments that the original readings are obscured I suggest the modern era be named the Datanotcene. Also the time of a major extinction event. 97% of the phylus ‘climactius scientisticus” seemed to disappear from all properly peer reviewed documents. It illustrates the sore state of science nowadays. Unfortunately it is not only climate but this is a very representative section of it => if the data does not fit your theory adjust your data. Just compare that with what has it become a decade later… not through better satellites/better data, but all through adjustments – all newer satellite data were adjusted to the previous adjusted data. The adjustments have warmed the past. Really, the past is infinitely larger then the present, so what past do you mean? Looks like Mears may have gone after the missing mid-troposphere tropical hotspot. Indeed. From the point of view of endorsement of AGW theory, finding greatly accelerated warming in the tropical mid-troposphere represents more of a coup than demonstrating modestly more accelerated warming in the LT.
Do the gatekeepers of government controlled temperature statistics ever adjust their numbers downwards? It would be nice to think that this was possible, even if it was only done once. Only peaks back in history to increase the more recent warming trend or to increase the difference between past and present. Adjustments to SST (bucket adjustment) lowered the centennial trend by warming the early part of the record. Sure. About half the time they go down, and about half the time, up. What part of this isn’t clear? I never trust data that has been adjusted to show a trend that didn’t appear before while it was in operation. Adjusting good data to bad data just because it matches the surface data closer is bad science practice. It looks like the Pause had to be MWP’d (verb, mod., trans), as in “we have to get rid of …..”. Begs the question….what will Sir Christopher Monketon make of developments? All temperature datasets are imperfect. All need adjusting as improvements in understanding are made. And if the improvements are reaching towards a physical reality about half the improvements will lower the trend and about half will increase a trend. But all the improvements increase the trend. @ M Courtney: Errors are not necessarily random in sign. Therefore, improvements may not be evenly distributed between positive and negative. Even so, the statement that “… all improvements increase the trend” is false. 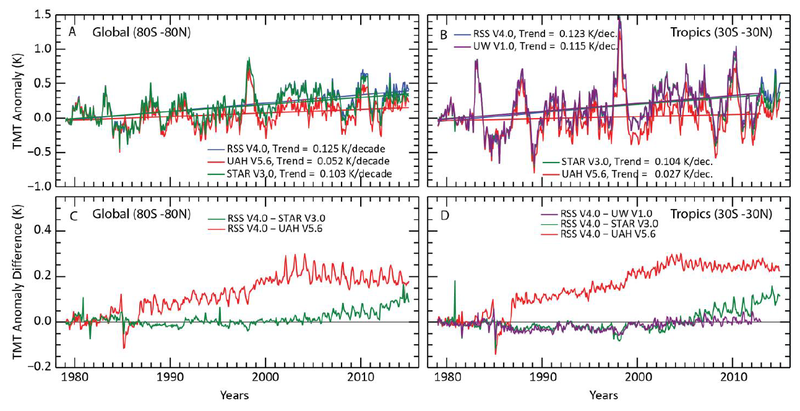 The previous major adjustment made by RSS decreased the trend of lower troposphere anomalies significantly. The most recent change (to mid-troposphere anomalies) is about the same magnitude, but in the opposite direction. Overall it cools slightly more at night over land, than it warmed the day before. There wasn’t reliable evidence for warming due to CO2 levels increasing. The pause highlighted that. Adjusting data to get back the warming only highlights it even more – the results are highly dependent on subjective choices in the analysis that were changed after the results were in. The null hypothesis is that there is no correlation. Uncertainty that there is a real pause of 0°/decade trend is not necessary. What is obvious is that the data doesn’t fit the model projections/predictions without revision of how observations are quantified. That red forcing estimate is *theoretically* calculated, not actually observed. Furthermore, the small increase in it (at best, 0.2 W/m2) is very small, and probably is swamped by natural variations…which are not shown. Conveniently, natural variations are not called “forcing”. Buncha nonsense. No one has ever measured AGW, so that’s merely speculation. You do realize that at the same location and encompassing the period used in the paper, another paper found a decrease in the total downwelling IR, right? CO2 band radiation only gets 10 metres before it is ALL absorbed. Those same molecules do ALL the reradiating that is detectable on the ground (because reradiation from higher up will also be all absorbed). Doubling CO2 takes that to 5 metres. Easy to imagine changes in back radiation detected by an instrument even just 1 metre off the ground as it is a significant and variable fraction of the distance towards the end point. And at ten metres height, everything you measure will be from radiation emitted by the immediate few metres vicinity of the instrument. Lots more wrong here but I’m typing on a mobile. There are no natural forcings or variations other than the Sun. Clouds and water vapor don’t change by themselves. Absent human influence you would expect them to remain the same forever. NO! I would not “expect” that ONLY humans influence anything in nature. Clearly man is not the only thing that can change the forcings. Volcanoes, solar, biological factors, erosion etc. These can all cause changes to the forcings, and these changes all have feedbacks, both positive and negative. However, if there were no change in the forcings, then we should expect things to remain much the same. Since there are so many natural factors that do affect the forcings, we would not expect a stable climate in the absence of man. Which is what we observe. …if there were no change in the forcings, then we should expect things to remain much the same. ‘Things’ remain the same. There is nothing unprecedented happening. There is nothing unusual happening. Everything we observe now has happened in the past, before human industrial emissions, and to a much greater degree. Sorry, but your “theory” is wrong. The data behind the .2w/m2 +- .06w/m2 (per decade increase of 20ppm co2) is from careful measurements over 10 years. this is an increase in down well Long wave radiation on a clear day. the forcing is modeled with an expectation of 3x effect from water vapor which is not observed. Its an interesting paper that has to be read carefully. The change in radiation for 20ppm is so nearly negligible as to be silly. Downwelling radiation varies 0 to 500w/m2 depending on location, time of day, wv etc. Willis’s thermoregulation effects would have no problem drowning out that little bit of nothing! This is easy to see with an IR thermometer pointed straight up through the optical window, a light haze changes the temp easily more than 10W/M2. could it be the posited water vapour feedback does not happen as there is a negative feedback that decreases water vapour in line with rising co2 levels ? maybe a stupid question, but i will ask it anyway. There is a limit to humidity every night when it cools, and maybe as the surface cools, there’s enough of a drop in upwelling IR that that isn’t proping up temps maintaining the humidity level. The elephant in the living room are the changes to the cloud albedo with increasing evaporation. That process is very complicated, but it is certainly not unreasonable to suppose that more evaporation leads to more clouds. Those white clouds are a direct, primary negative feedback on the insolation that reaches the surface. Tom Yoke wrote that increased water vapor from warming means more cloud cover. It’s not so simple. Instead, clouds are becoming more concentrated. Because clouds are becoming more concentrated and their associated updrafts are becoming more intense, the percentage of the world covered by these has been decreasing. The percentage of the world covered by clear air and downdrafts has been increasing. This means global atmosphere average relative humidity has been decreasing. However, the amount of water vapor has been increasing less than if global atmospheric average relative humidity remained constant. This makes the water vapor feedback less positive than if relative humidity remained constant. That line is from the Mear’s paper, that’s why I was wondering. And your source for that was? I probably don’t have to add anything to the debunking. I’ll just summarise. Its less than 0.1% of the average amount of down welling over the globe. Even with only 1°C change in temperature over a 24 hour period for the TOA, that’s 2 times bigger change in intensity than 20ppm rise in CO2. Possibly well below the precision of the experiments but ignored like with Ocean Heat Content. The overall intensity of LWIR from a clear sky had diminished so the vast bulk of the GHE, the positive feedback, is not consistent with the data. There is not much doubt that more CO2 in the atmosphere will increase the intensity of LWIR emitted near the detector for certain wavelengths but from nearby, not the roof of the glasshouse. Then you need to show that the world is warming as the models predict. I routinely measure 80F – 100F difference between the temp of my east facing concrete sidewalk, and the temp pointing straight up under clear skies. On a typical 50F day, Tsky reads -40F, and while the optical window doesn’t have any CO2 IR, at that temp (which is the temp the surface sees over the high temp portion of the band), adding the 3.7Wm2 to that temp, makes about 2-3F difference in Tsky, so instead of -40F it becomes about -38F instead. Varying types of clouds make as much as an 80F difference in Tsky. Varying humidity below about 80% rel humidity hasn’t made an noticeable difference in Tsky, you can see this in the night time clear sky cooling rate (8-10F/hour) until rel humidity gets into the mid 80+% rel humidity or higher, where the cooling rate can drop to between 1 and 2F/hour. So there’s not enough room in any of these measurements to allow for much in the way of added Co2 or excess water feedback. Add on to that, that you can take the measured change per day for a year for hundreds of stations each year, and plot the slope of the temperature and compare this slope over multiple years, and it doesn’t show any sort of a trend. All this leads me to say, the change in Co2 isn’t causing any of the changes is surface temp (if any of it is actually more than processing artifacts). dbstealey. My post says that there will always be changes to the forcings with or without man, so without man there will be changes to the climate. This is what we observe from studies of past climate. It is obviously wrong to say that only man can change the climate. It is also wrong to say that the climate changes for no reason. Can you explain which part of this you do not agree with? Mears’s repeated claim that skeptics are cherry-picking the start year for the pause, despite repeated explanations that it’s calculated backwards from the end, makes him nearly as bad as anyone on his side of the fence. Well, frankly I see no difference in cherry-picking a year and calculating how to cherry-pick it. The latter is more efficient of course. The hiatus won’t go away by telling the date is cherry-picked, though. But the essence of cherry-picking is about truncating the graph, not about calculating a date. ummm…I’d be interested to know exactly how that “CO2 derivative” curve was computed…it does not look like any I have computed from CO2 data. 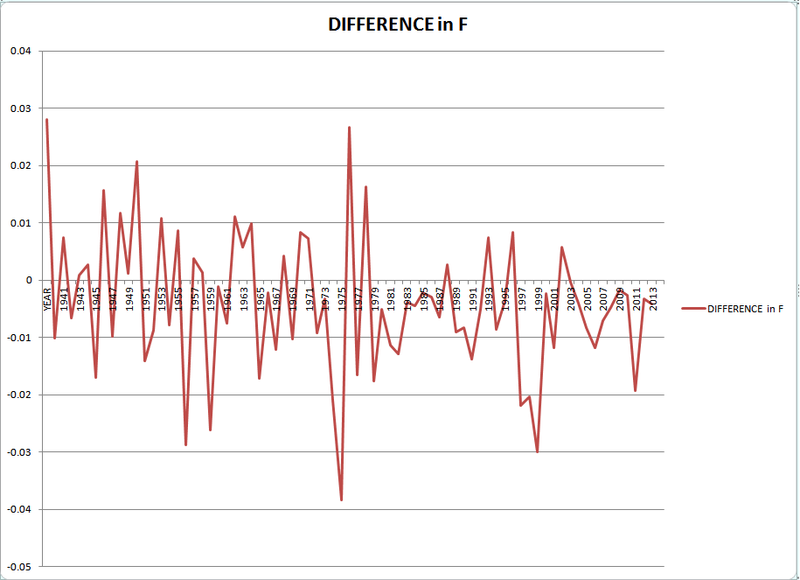 I assume first differences divided by time interval, with 12 month running average to eliminate the yearly fluctuation. That is how I have done it in the past, with similar results. Here’s the originating plot at WFT site, which you can play around with as you like. IIRC, I did have to interpolate the data at uniform monthly intervals in order to apply a uniform 12 month averaging filter. 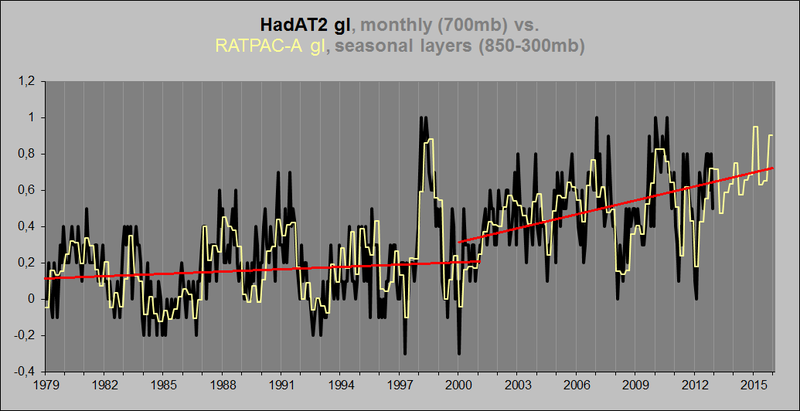 Here is a comparison over the longer term with HADCRUT4SH data. The surface series are probably too corrupted to trust in general, but of the ones available at WFT, this one seems to best match the satellite data over the period of overlap. It appears that most of the tampering takes place with NH data. Carbon Trioxide – now with 50% more warming! Re Bartemis’ link to Wiki, CO3 is an “oxocarbon”. Is this something like an oxomoron? I have always used UAH LT data – fortunately, it now seems – I just did not fully trust those RSS’s. COOLER than June, 2012: +0.37 deg. 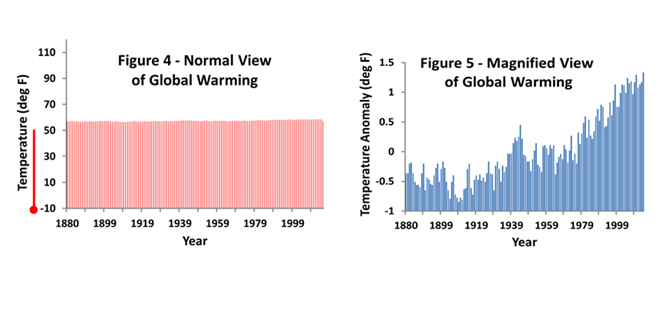 If one wants to argue about GLOBAL warming, should one not look first at GLOBAL temperatures? People had some fun with your typo. Enjoy it. well, the rate of change of CO2 can’t support the temperature PAUSE because, with linearly increasing CO2 with time, a plot of the rate of change with time is FLAT. Well, yeah, just like the temperature is FLAT. 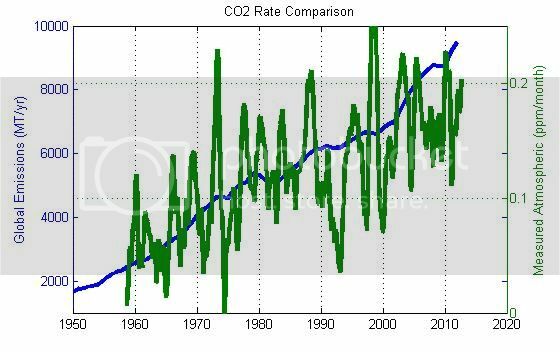 But, prior to the “pause”, the rate of change of CO2 shows more than flatness. It shows a proportional change with temperature anomaly relative to an appropriate baseline. I.e., the rate of change of CO2 is a proxy for global temperature, both before, and after, the onset of the “pause”. Murry Salby observed this and explained it in terms of ocean outgassing. That may not be true. Bartemis. There is something very wrong with the reported co2 levels. There is also something wrong with the statement that the IPCC can tell the difference between naturally occurring co2 and anthro co2 by isotope ratios. And there is also something wrong with relationship between co2 and the sink rates. There is no way that the sink rate for last year could possibly equal the sink rate for 30 years in the late 19 century. And yet during that time period there is a small rise in co2 levels each year? To believe that such small levels of co2 could not be absorbed is close to insanity. I don’t think so. The rate of change matches the pre-Karlized (and now Mearized) data quite well. I believe this is due to temperature modulation of natural flows. Ferdinand Englebeen and I have been arguing about this for ages in various comments sections here on WUWT. I agree. The isotope ratio lends itself to an interpretation which is merely consistent with attribution to the burning of fossil fuels. But, it is not the only interpretation, and consistency with an hypothesis is not proof of the hypothesis. The claim that “we can’t think of any other way for it to happen” is argumentum ignorantiam. Process of elimination only works when you have a full set of alternatives to winnow down. I think that anything which is not directly measured and which cannot be verified by independent means, such as ice core CO2 estimates, should be considered with a high degree of wariness. Especially when the year-to-year variation is so much greater than that small input, and the natural flows are are greater by more than an order of magnitude. Please note: the claim that the rate of change of CO2 is a valid proxy for global temperature anomaly is NOT a claim that CO2 drives temperature, but rather the reverse. Due to the differential relationship, the arrow of causality is necessarily in the direction of temperature driving CO2. There were adjustments to surface temperatures based on the satellite data, openly. I didn’t read up on what it was. There is something wrong for there to be such a good correlation with an uncertainty of 0.1°C for the temperature. Divide that by your scale and the dCO2/dt corresponds to 0.02ppm/month. The greatest difference in the plot is 0.2. So its magic just from the uncertainty in monthly temp anomaly that they correlate let alone that the global CO2 is measured at ML to within a 1/100th of a ppm. Nonsense. Coherent formations which replicate in both signals are not “noise”. It is a high pass filtering operation. It passes signal as well as noise in the higher frequency band. CMS’ chart shows that CO2 does, indeed, lag temperatures in that band. For attribution of the observed rise, though, you have to establish that the signals match in the low frequency regime as well. And, they do in the modern era. The phase lag of 90 deg is uniform across the entire spectrum, which is why there is such a good match to the differential equation dCO2/dt = k*(T – T0), for appropriate constants k and T0. Those arguing for anthorpogenic attribution for the observed long term rise either implicitly or explicitly allege that this remarkable match is mere coincidence, and that nature somehow separates the high and low frequency responses such that humans are responsible for the latter. But, that is just arbitrary dismissal of what would be an astounding happenstance if true. In fact, there is no reason that nature cannot be responsible for virtually the entire observed rise. It fits the data seamlessly, and it is much less complex a relationship. Occam’s razor comes down squarely on the side that atmospheric CO2 is temperature driven, and human inputs have negligible impact. This is strange. The comment to which I was replying disappeared after I posted. Probably a momentary glitch. If it does not reappear, know that I was not replying to CMS, but to a comment that had taken issue with him. Those that control the present, control the past; those that control the past, control the future. Why am I not surprised. If a crime has similar modus operandi to other crimes it is suspected that there is a single group or individual behind the crimes. We are supposed to see nothing, hear nothing, and say nothing. Just believe and the cool aide will go down easier. The cool aide? Is that similar to a hot assistant? Just as each successive crime becomes easier (so they say), just so for each upward adjustment. So the trend changes by 0.05 K per decade. Does anyone know how this compares to error estimates for the overall trend? Of course, coming up with realistic error estimates is often much harder than calculating the function itself, so maybe we don’t even have any. I thought these satellites were compared against the weather balloons. That should settle the discrepancy shouldn’t it? Yes, but the change, although highly questionable, still leaves the satellite record far below what the models predict! Unfortunately that is not what the MSM will publish. I have to say I’m not surprised. When I saw that video with Mears and how utterly deceitful he was being trying to fool the listener into thinking that trending is simply drawing a line from point A to point B, along with other deceptions, I knee this guy was a lying sack who would do anything. I have a concern regarding the satellite Remote Sensing System RSS. It is remarkable that he uses the term «denialists». A term which can be regarded as nothing else than name calling. Being a Vice President I imagine that Carl Mears is quite influential in that project. 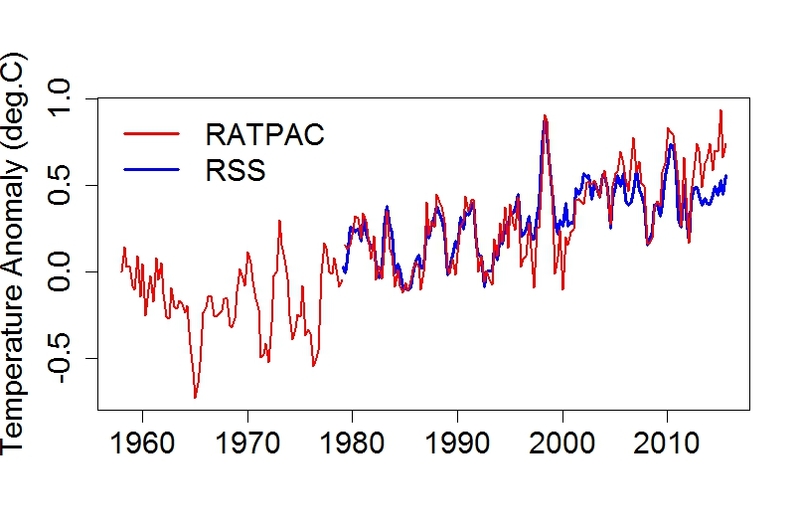 My guess is that we will soon see dramatic changes in the RSS temperature data series. I would be greatly surprised if we will see a cooling trend. Bravest of the brave, Sir Robin! Help us, Roy Spencer and John Christy, you’re our only hope. Oh my. I am surprised that the folks at RSS are not less transparent. What will Congress say if one of the satellite data centres starts to “adjust” their temperature data as well. This is turning into one big mess. The real problem will be trying to cool the recent past, the last 15 years, to make the temperatures look warmer in the future than they are now. The other problem will be if temperatures drop so much that they can’t possibly adjust the temperatures of the past 15 years to compensate. ( I bet they use the unadjusted satellite data then) Another problem was when they stated temperatures in 2000, they weren’t adjusting the past temperatures to fit. There are 2 different time scales involved, 1) is the temperature comparison from the year 2000 going back They didn’t have to adjust the data for that. ( well maybe, we don’t know, the original data records are in a landfill and those temperatures becoming the original were adjusted. They said so on that and there was no way to confirm what they did) . 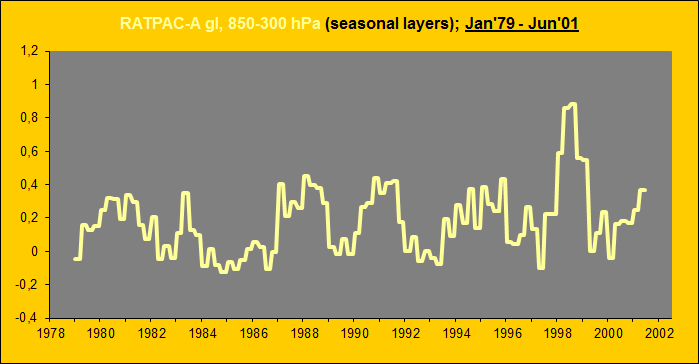 and 2) the adjusted figures from the past to show that it is warmer now. This is the most cracked pot science ever. There is no certainty in any of it. The only two things I am certain of is that there was a MWP and a LIA, both of which they have magically made to go away. I can see the graphs of the future will have time and spatial distortions, maybe from the newly found gravity waves. I am altering the data. Pray I don’t alter it any further. UAH adjusts down, everyone is happy. RSS adjusts up and cries of impropriety. The denominator is obvious and has nothing to do with analysis of any worthy character. How many times has UAH been adjusted down? of time variations of hot target temperature), 2004 (tightened criteria for data acceptance), and with V6, which is still in Beta as Spencer and Christie await peer-review of their latest set of adjustments. I got the same info from a different source. 4 down adjustments (and a number of up adjustments). I was referring to the recent revision (2015 Beta6,) which adjusted the latter part of the record downwards, and which everyone here was pretty pleased with. Upwards bad. Downwards good. That’s the tenor of the general view here. If you can’t see that, then you’re embroiled in it. barry – Michael showed the UAH adjustments you were railing against are utterly negligible. Bartemis – I have no problem with UAH or RSS trying to improve data sets. My point was that others do – only when the adjustments are in a direction they don’t like. Some devotees from ‘the other side’ had a go at UAH for their cooling adjustment, too. This reflexive criticism is tribal, not neutral, and perpetuates the irrationality that pervades the general debate. RSS published their methods before changing the data set (TLT has not been updated as of this time). Karl et al methods are also in the public domain. UAH have yet to have their methods published. Unless “a different kettle of fish” merely alludes to the direction of the adjustments. It is clearly the denominator here for criticism/approval. A cumulative net +0.069 deg C/decade rise. Barry, you can apologize now. Feel free to link any article at WUWT that called into question UAH revising their data downwards recently. Any article that mocked UAH for ‘tampering’ with the data. An article like the one at the top of this thread. When you post a WUWT article that criticized UAH for their recent version update, in terms similar to above, then I’ll apologize. You won’t find one. Because upward adjustments = bad, and downwards adjustment = good. That’s the tenor here, and you know it. It is true that upwards adjustments are carefully scrutinised here. But if they are well founded then no problem. On the other side of the fence, believers subject downwards adjustments to intense scrutiny and have a tendency to give upwards adjustments a free pass. The UAH upwards adjustments were made for transparent and logical reasons and nobody disputed them here. But the Karl adjustments and recent RSS adjustment are a completely different kettle of fish. One glance at the difference between old and new results in 9C and 9d should’ve made the authors and reviewers freak-out and determine that the new dataset is garbage. One. FWIW, made essentially the same comment as this post on the previous thread. AW is correct. We now have Karlization and Mearsization. Same ization. Erase that darned pause. No matter how. And next verification of the “hotspot” in 3, 2, …1. The RSS and UAH pause disappeared with the February numbers. Do they want to shoot themselves in the foot by showing adjusted data that do away with the pause? The impression will be left that the adjustments removed the pause. Unfortunately 80 percent or more of the population will only read the headlines. But Werner, you’ll be there to inform the malcontents that the pause disappeared before the RSS adjustments. What I find amusing is that about a year ago Dr. Spencer, on his own site, expressed an opinion that the RSS data was running cool , and that adjustments in the works on his own UAH data, which he indicated was bit warm, would correct downward. The big surprise is when the UAH data was cooled very close to the RSS data that Dr Spencer said was too cool. Crazy. The Pause has existed and its importance remains whether or not ‘adjustments’ remove the Pause. I remind of a post I made on another thread and I copy it to here to save others needing to find it. Obviously, I was not sufficiently clear. I will try to clarify. This semantic argument is important because the existence of the Pause for 18+ years remains a fact and we need to be clear about its existence and what that existence has demonstrated whether or not the Pause has now ended . 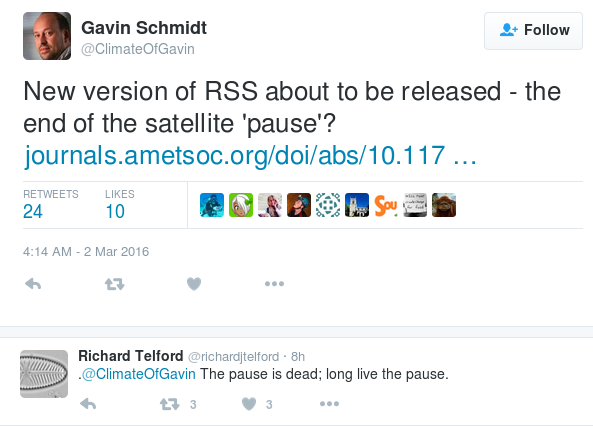 I, too, am using the same definition of the Pause as you and Viscount Monckton. You have shown that there is now no Pause. But there was a Pause. Therefore, the Pause has stopped. But the Pause having stopped does not mean the Pause must have ended. (A train traveling from London to Edinburgh has not ended its travel if it stops at Birmingham New Street). (b) was part of an ENSO oscillation. This provides three possibilities; viz. 1. The Pause may have ended and will not resume because warming has resumed. 2. The Pause may resume when global temperature drops at completion of the ENSO. 3. The Pause may be replaced by global cooling after completion of the ENSO. In summation, the Pause has stopped and we will know if it has ended after completion of the ENSO. And I repeat that whether or not the Pause has ended, the Pause has demonstrated that predictions (or projections) of climate models are great overestimates of global warming. Torture numbers long enough and they’ll tell you anything you want to hear. The pause is gone in UAH without any adjustments. It was expected to go for RSS in the first few months of this year. Of course, the uncertainty is larger than the trend for 1997/98 to present global TLT, so ‘pause busting’ is qualified. However, that qualification applies to the pause itself. As the pause was a period with no statistically significant trend, and the uncertainty envelope overlapped with the prior, warming trend, There was no statistically significant evidence that the long-term trend had subsided. The pause should always have been qualified with ‘apparent’, or ‘possible,’ as it usually was in formal publications. As the pause was a period with no statistically significant trend, and the uncertainty envelope overlapped with the prior, warming trend, There was no statistically significant evidence that the long-term trend had subsided. The pause should always have been qualified with ‘apparent’, or ‘possible,’ as it usually was in formal publications. Box 9.2 | Climate Models and the Hiatus in Global Mean Surface Warming of the Past 15 Years. Fyfe says that his calculations show that the planet warmed at 0.170 °C per decade from 1972 to 2001, which is significantly higher than the warming of 0.113 °C per decade he calculates for 2000–14. You can add your apology for the falsehood I have here refuted to the apology David A suggested you provide for your earlier and different falsehood in this thread. That section of the IPCC does not discuss trend uncertainty. It compares models with observations. Trend is anywhere between -0.17 and 0.34C per decade. If the uncertainty in the trend since 1998 overlaps with that window then there has been no deviation in trend to the 95% confidence interval. The envelope of the trend estimates overlap not only each other but also the mean estimates. The trends have not deviated to statistical significance. Moreover, both trends fail the null hypotheses. There is no statistically significant evidence in either of any warming. 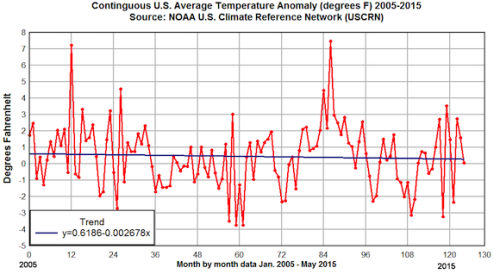 Yet the full record shows a warming trend and that is statistically significant. The uncertainty minimum is greater than zero (0.06C/decade), passing the null hypothesis test. The two segments are too short to determine that signal. And way too short to determine any warming, pause or cooling. There may be better evidence for a slowdown or pause by examining the whole system or other data sets, but this discussion is, as often, focused on the TLT record. No such evidence is found when examining the whole of that data set (instead of the 2nd half exclusively). Not statistically. If anyone can see something statistically incorrect about the above – and accurately address my actual comments – I’d be glad to hear from them. I find claims of statistical significance very tiresome. Statistical inference requires a statistical model. If the model is wrong, then the inference is likely to be wrong. Most often, I have seen an arbitrary AR(1) model used to claim statistical properties. But, these data are correlated with a long term trend plus an approximately 65 year periodic correlation, which requires at least an AR(2) model. In the face of that, statistical inference using the former are GIGO. Bartemis, it’s an ARMA (1,1) model. 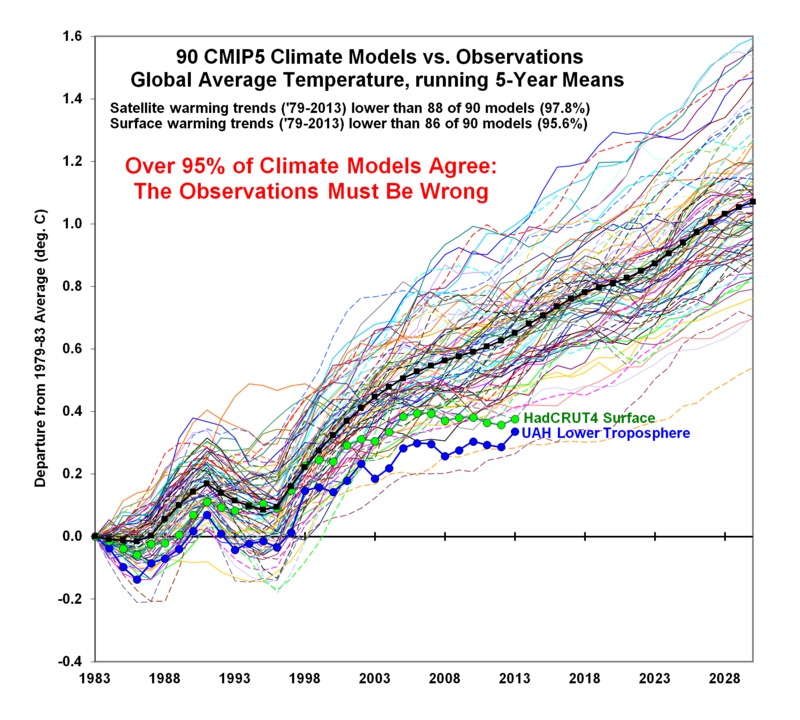 …the IPCC does not discuss trend uncertainty. It compares models with observations. barry, you’re quite the little parrot, spouting the latest talking point: “Global Warming Nevah Stopped!! For the past ten years or so, people like Phil Jones acknowledged that global warming had stopped. Question: why lie about it, when that fact is so easy to prove? A “hiatus” is a stop. 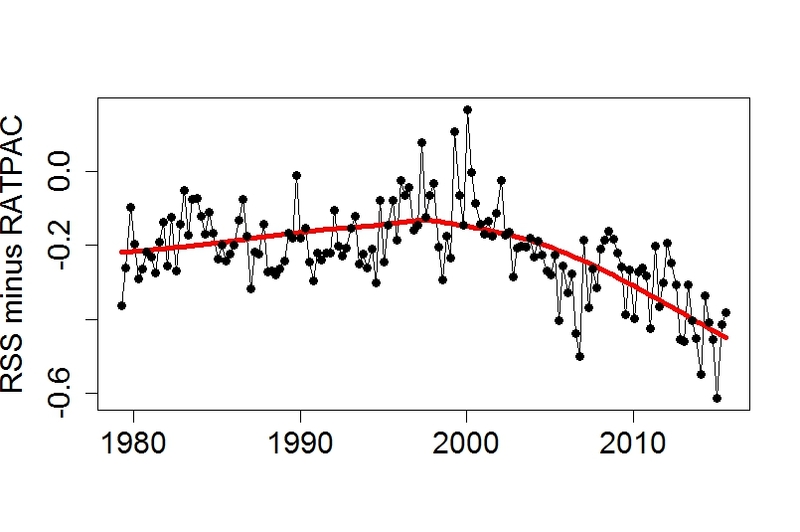 Figure 9.8 demonstrates that 15-year-long hiatus periods are common in both the observed and CMIP5 historical GMST time series (see also Section 2.4.3, Figure 2.20; Easterling and Wehner, 2009; Liebmann et al., 2010). However, an analysis of the full suite of CMIP5 historical simulations (augmented for the period 2006–2012 by RCP4.5 simulations, Section 9.3.2) reveals that 111 out of 114 realizations show a GMST trend over 1998–2012 that is higher than the entire HadCRUT4 trend ensemble (Box 9.2 Figure 1a; CMIP5 ensemble mean trend is 0.21ºC per decade). This difference between simulated and observed trends could be caused by some combination of (a) internal climate variability, (b) missing or incorrect radiative forcing and (c) model response error. These potential sources of the difference, which are not mutually exclusive, are assessed below, as is the cause of the observed GMST trend hiatus. GMST trend is global mean surface temperature trend. And there cannot be a known “difference between simulated and observed trends” in the absence of ascribed certainty to those trends. Which is completely inappropriate and arbitrary. The end of the pause in UAH is unsurprising and insignificant. At the height of an El Nino one would not expect to see any significant pause. The pause is defined as how far back one has to go to find a statistically significant rate of warming. As an El Nino year is typically significantly warmer than the few years that preceded it the answer in an El Nino year is almost by definition small. Unfortunately for the pause deniers, unless the El Nino ushers in a step change such as the one we saw in 1998, once the El Nino is over the pause WILL RETURN even larger (due to the passage of time) than it was before. None of us actually know with certainty what will happen next year. But I think the odds of this El Nino kicking off another 1998 type step change are pretty slim. The pause deniers crowing about the end of the pause at the very peak of an El Nino are grasping at straws and will likely have to eat their words next year. I would say, the pause liars, for the simple reason that they were arguing about what ‘explanation’ to attribute the ‘pause’ that they accepted as a fact as recently as last year. This includes the IPCC. Now the new talking point is ‘The pause never happened!’ Just another desperate case of “Say Anything”, and hope it sticks. Well, there is no “pause.” Not one single dataset shows it. On a longer time scale we are within long term parameters. There is nothing unprecedented or unusual happening, much as you wish it. The pause is ending. So you’re wrong again. When are you gonna pay off on your bogus ‘challenge’? Eventually the data will be massaged so much that it contends when we step outside on a summer’s day we will all spontaneously combust. Yeah right. Did someone put the thumbscrews to Mears’ funding source? …even warm-oriented scientists such as Michael Mann and Ben Santer co-authored a rebuttal paper that said Karl was dead wrong and the pause was real. Actually, they said the period represented “a ‘slowdown’, not a ‘stop’.” [actual quote from the paper]. They did not corroborate the notion of a pause or hiatus. Rather, they concluded there was a ‘reduced rate of warming’. They’re making up stories now. Last year none of them were saying that global warming was chugging along as usual, and they had the same info they have now. In fact, they were making up endless excuses to explain the fact that global warming had stopped. But now the Narrative has changed. The new talking point is that global warming never stopped. Every one of them and their lemmings have turned 180º, and are now effectively repudiating what they were saying before. This is just dishonest. They’re at the point now where they will “Say Anything”, rather than admit that global warming had halted for many years. They’re not stupid people, barry. But they are certainly ethics-challenged. Wouldn’t you agree? barry, your really hurting here. Barry reminds me of another ‘drive-by’ contrarian who sometimes posts here. Plenty to say, plenty to protest about. Long on rhetoric yet every time he is called out on the substance of his post he never returns to acknowledge how wrong he is because he’s already on his next spray and pray attack. To get back to the point, the study mentioned does not say what the author of this article purports it says. There was much discussion over the apparent slowdown/pause/hiatus in global temperature. Views were not uniform, and language in commentary is often decontextualised. Ie, to remove qualifiers like ‘apparent,’ or, in the Santer example you give, to remove the quotation marks around “warming hiatus” and ignore that the paper refers – without scare quotes – to muted warming. Which, by the way, matches the language in the study mentioned in the OP, also co-authored by Santer. So Santer doesn’t corroborate a pause, he thinks there has been a slowdown in warming. This is consistent between each of the studies mentioned here just now that he co-authored. The apparent “pause” was never going to last, as many regulars here predicted. Rather than quote mine to set a false impression, loosen your grip. So now it was just an “apparent slowdown” of global warming. You have zero credibility. You’re just parroting the new talking points that your disreputable leaders tell you to. “Views were not uniform” – oh, so there was no consensus on that? Are you telling me that climate scientists can look at a zero trendline and then not uniformally take the view that the trend was zero? Are they really that stupid of a bunch, or is it just you? It “was never going to last”…well, almost two decades seems like “lasting.” It is certainly well-beyond anything that the warmistas thought would happen. It even went beyond the period for which some scientists said was possible. And it still flies in the face of models and global warming theory regardless of which dataset you use. If you’d rather just take the “apparent slowdown” data that currently exists or go back to when data clearly showed an extended “pause” ranging from several years to almost two decades (depending on which dataset you looked at), fine. It still doesn’t fit the narrative and leaves much explaining to do. On the contrary, I’m quoting the studies a) mentioned in the article, and b) cited by you. There are other sources, I just looked at the ones provided and realized they didn’t say what was promoted. You can see for yourself with the Santer paper that was the focus of one of your links. “Warming haitus” appeared just like that – with quote marks – in that study. You removed them, decontextualizing that the authors were holding the notion at arms length. In the first comments in their abstract, they refer to ‘muted’ warming and later a slowdown. I am not revising history here. You can corroborate just with a few clicks. I followed your other link to the Met Office article, which also speaks of a slowdown, not a pause. You can track that back for yourself too, and see. It’s small fudges like these that can lead to a misapprehended overview. There was never one opinion on global temps over the last 18 years or so, but the tribal nature of these comments sections prefers binary, us/them characterisations. Grist for gut reactions, but poor analysis. You didn’t even read the link right above by David A, did you? You are parroting the “no stop in global warming” Narrative that you’ve been issued. If you had read the link, you would see all the scientists who were acknowledging the fact that global warming had stopped. Arch-Warmist Phil Jones is there, too, admitting that global warming had stopped, and talking statistics. There are plenty of similar quotes. Just scroll down toward the end. You can read them all. They are lying, barry. Lying through their teeth. That’s extremely easy to prove with the internet. Just read the link, from last year. The question is: why are you passing on their lies? Is your self-respect that low? The cited study and article was misrepresented by you, as was the study cited in the OP. They speak of a slowdown, not cessation of global warming. All of them. Presumably you agree, otherwise you would have addressed the point directly rather than move on to a different one, and repeating the canard doesn’t hold up well when your first 2 examples failed. There are more quotes like those, admitting that global warming stopped. Wake up, barry. You’re just parroting the new Narrative. But your talking points aren’t science. They’re just alarmist propaganda. They are flat out lies. First sentence in the Santer paper. The relatively muted warming of the surface and lower troposphere since 1998 has attracted considerable attention. Hiatus is in quotes because they are referring to popular usage, not because they think no warming occurred. The other paper in your link to the WUWT article (Ridley et al) has this as the opening of the introduction. Over about the past 15 years, globally averaged surface temperatures have increased more slowly than during the two previous decades (≈1980–2000), a phenomenon sometimes referred to as the “hiatus” or “pause” in global warming. Increased. More slowly. A slowdown. They mention the popular terms for this period. These are the sources you first cited. These you have ignored since I checked them out and corrected your misrepresentation. I’m going now to the first cite in David’s link. If it proves to be as misrepresented as these examples – cited by you – I won’t be bothering with the rest. The pattern of distortion will be clear. Of course researchers with any stats skill would scorn him if he said that. 7 years of data fails statistical significance. You couldn’t possibly say it was warming or cooling or flat with that time period. Jones is quite right – ridiculous to make a claim about any trend with so little data. Presumably you’re quite aware of that, as you’ve been present at discussion here regarding statistical significance. The first item in the list is another distortion. So what we have are, as I said, a range of views about an apparent slowdown, or “hiatus” or “pause” for the period. Others disagreed that there was a pause at all. I am one of those. From your point of view, this puts me at odds with Mann, Santer, Ridley and others. I’m hardly parroting their views, according to your take on the, am I? That’s the facts of the matter. A range of views, not some binary “gotcha” scenario invented for an easy win in a net argument. The truth is rarely so simple. No mater how much we’d like it to be to shore up our views with as little effort as possible. I think I’ve shown that there was no pause – not to statistical significance – in the first place. That would be the post you ignored while diverting to what other people have said. Perhaps the name-dropping can stop and you can return to the substantive part of the comment. Discussions about quasi-famous people is so Who Weekly. What makes the warming in general nothing more than natural internal and external forcing? Or a processing artifact from infilling and homogenization because there is internal variability and that was processed into a warming trend? There is no loss of nightly cool, when it’s compared to the prior days warming, none since 1940. And lots of evidence of regional variability, and measurable evidence of the impact of land use changes. barry is now at the ‘Say Anything’ stage. He’s simply passing on the new talking points. And he quotes the über-deceptive Ben Santer, the lead author who personally reviewed and approved Chapter 8 of the 1996 IPCC Report. Now, twenty years later, there is still no verifiable evidence quantifying any global warming attributable to human CO2 emissions. So barry had best find another ‘expert’ — one with an ethical backbone. That leaves out Ben Santer. At the step back and look at the big picture level, it’s all getting a bit pathetic isn’t it? These supposed grown-ups who purport that increasing atmospheric CO2 levels pose a threat to humanity because the temperature is going up, all hootin’ and hollerin’ and high fiving because the temperature is going up. Sad people. Especially since their funny math caused most of the warming. Oh it gets worse. You’re leaving out the people who hope for catastrophic weather events so that they can be used to suit their narrative. …. not to mention Arctic ice, where it’s a disaster if it melts a bit. It must drive them crazy that cognitive dissonance alone cannot melt ice. Yeah, but the heat went up because of El Nino, not because of increased carbon dioxide in the atmosphere. The ‘warmists’ are the ones trying to warn the public that AGW is not a good thing. If they are warning the public about something not good, how does that now become ‘jumping up and down with glee’? Really comical that ‘Climate Science’ relies on so called ‘Version’ numbers for their Data Sets. I didn’t know that Science had ‘Versions’. Did all the great Scientists of the past have ‘Version’ numbers? UAH is on Version 6.0 beta 5. I kid you not. Google it. Also, try googling ‘astronomy data set version.’ Plenty of hits. Revising and improving data is part and parcel of research. You can try googling under ‘medicine’ or any number of scientific disciplines using data sets. Thankfully, no serious researcher assumes the first, second or latest data set is perfect. It would be unbelievably intellectually lazy if they did. Hence, as dcpetterson points out, UAH satellite record, favoured here by many regulars, has numerous versions, with many adjustments to the record as a result. Their latest version (6Beta) has been much hailed here, as it cooled the record a little. 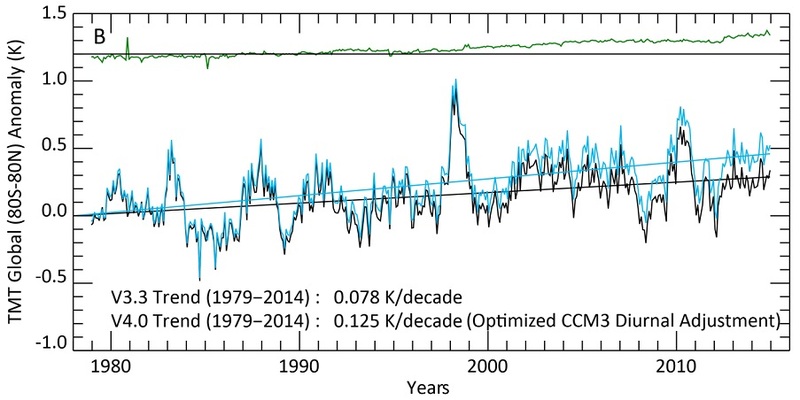 Yeah, linear trend changed from 0.0139 deg C/decade to 0.0114…OMG!!!! What “hailing” are you talking about exactly? The hailing of UAH being adjusted so that it was closer to RSS. This was seen as a corroboration for the pause-o-philes. Bob Tisdale posted early on it, saying that the satellite temps were now in agreement, therefore more likely ‘correct’. 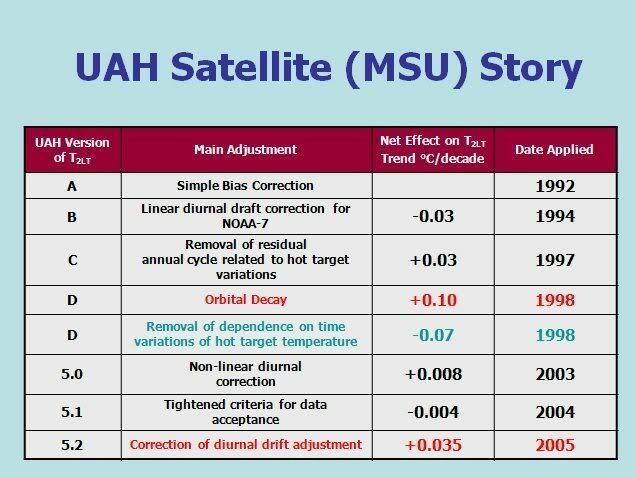 Bottom line for the UAH changes: unlike with the NOAA data, we can’t say the changes to the UAH data are unjustified because they are so similar to those of RSS, and, as a result, we also cannot say the UAH data are overcooked…or undercooked, depending on your point of view. You can find plenty of evidence of satisfaction with this result in the comments section around that time. But the point is, adjusting data sets is par for the course for EVERY research group. D.I is strangely miffed by this ordinary part of science. Yes. “Adjustments” happen. It is surprising anyone here thinks this is unusual. There is no other way for the self-correcting nature of scientific research to proceed. Anyone who pretends that “adjustments” are part of a “conspiracy” is not familiar with how science works. Yes, they are constantly adjusting their models but don’t forget, the science is “settled” and you are a bad person if you don’t immediately agree with latest version of the constantly moving alarmist position. We’re talking about data, not models. We can question the adjustments all we like, including upwards and downwards revisions (like the recent UAH revision). But without in-depth analysis it’s hot air. And, anyone who pretends that adjustments cannot be manipulated to achieved a preconceived outcome is a naive simpleton. Especially when the adjustments have consistently been in that direction. Some folks just change datasets quietly and don’t bring any attention to them. Which do you think makes more sense? The confusion here stems from the notion of “data.” What we are looking at here are not raw data, which really shouldn’t change over time, but the end product of a complex calculations that, apart from the raw data, also contain interpretations and corrections. There may be legitimate reasons for changes to the latter. Indeed, raw data frequently need to be calibrated, as the MSU data have since the start of the measurements, correcting for the orbital decay and the diurnal drift etc.. It’s not always apparent that an error exists, for example when a new satellite is deployed, and post hoc calibrations have to be done. I don’t know how to find my old comments on this site, but I am pleased to have coined the term Karlization here on WUWT right at the time they came out with the pause buster. Originally I called it Tomkarleization but shortened a short time later. When the Mears, Mann et al video came out, many laughed and joked about it here. I wrote at the time, it was no laughing matter and that any good poker player would recognize the “tell”. I said to watch for the RSS to diverge from UAH and an excuse about diurnal drift or orbital issues that make it look cooler. I also noted that in the video they criticized the work of Christy and Spencer, marginalizing their work deliberately so that when RSS was bent upwards from UAH, they had already make UAH guys look like buffoon incompetents. I was right on all counts but don’t recall any readers at the time agreeing with me. Anyone for an evening of Texas Holdem? PS, I also criticized Bob Tisdale and Christopher Monckton for always using the new revised numbers of the clime syndicate for their critical reviews, telling them both, that if they continued to accept the alterations to the data sets that one day neither of them would have anything to say at all. Bob’s and Christopher’s work would be squeezed into irrelevance. The error bars on these measurements of the whole earth’s temperature just can’t be large enough considering all the corrections that are necessary. And now the difference of opinions about the corrections! I used to be an automation engineer long time ago. One thing I learned from the measurements was that every measurement has an error. The absolute error is not important but the most important issue is, is there any drift in a measurement i.e can a measurement give the same result for a phenomenon exactly in the same conditions after one or 10 years. This means that the trend is important and not the absolute value. Just looking for UAH adjustments it looks like that they have been corrected data in order to get the absolute value right. I think that it is extremely difficult to adjust the internal weaknesses of any measurement afterwards. I would rely on the trends of any measurements without any adjustments. RSS for USA In February still shows almost exactly the same temperature as in 2005. Guess USCRN is still keeping them about 2% honest. As I said earlier.. near ALL this El Nino forced warm peak is coming from WINTER in Europe and Russia. and I BET no-one up there is complaining..
least of all the “recent immigrants”. “You know”, I’m not surprised at all. Liars all. It seems that Paris was a real confidence booster. Now they feel free to just make it up as they go. I knew they would come after the satellite data. “has not warmed quite as fast” ???? They make it sound like we’re only talking a couple percentage points of difference. Once again, I urge everyone to stop reporting anomalies and start reporting temperatures. Regarding the NOAA-14/NOAA-15 treatment, as far as I can tell, this was handled very similarly in RSS v3.3. If this is indeed the case, then, it is evidently not the source of the reported trend increase from RSS v3.3 to RSS v4, and the statement that “it looks like they decided to force good data to match bad data” in this regard is misplaced (by at least several years). Is there something I am missing regarding a new handling by RSS of the NOAA-14/NOAA-15 transition? (Also I think UAH v6 uses NOAA-14 through July 2001). It was obvious for some time that we were being lied to about global temperature by official ground-based temperature sources because they simply denied reality that satellite observations reveal. I kept saying to myself that luckily they still don’t control satellites or we would have no idea what the temperature is doing. It looks now like they have succeeded in taking control of one of the two satellite services that exist by converting Mears. Wonder what’s in it for him to make such a radical change after years of reporting actual observations. The warmists have so revised most ground-based temperatures that it is hard to know what to believe. As far as Karlism is concerned, I wrote a paper that you published on October 29th pointing out that his attack on the current hiatus is not the first one nor the only one on record. Their first attack on hiatuses involved suppression of knowledge that a hiatus existed in the eighties and nineties. They covered up its existence in official records by a phony warming called “late twentieth century warming.” As a result, this phony warming has been part of the official temperature record since the nineties. Fortunately, I was still able to show the hiatus, based on satellite data, as Figure 15 in my book “What Warming?” It was also an inspiration for the title of my paper last October which reads “Karl et al. do not know that we have had two hiatuses, not one.” When that little warmist spy calling himself “Bob Tisdale” saw it he immediately libeled me by stating that “Arno: it’s good to see you up to your old tricks of misrepresenting data.” On top of which he also produced a totally phony temperature chart, allegedly of satellite origin, that did not exist. This and similar garbage should be snipped, but you, Anthony, did nothing about it. We should all get to know why they hate the hiatuses so much that they are willing to falsify records. The answer is very simple: if observations of hiatuses are accurate the greenhouse warming, their only reason for existence, does not exist. It goes like this. First, during a hiatus, atmospheric carbon dioxide increases but global temperature does not. The Arrhenius greenhouse theory they use for climate predictions requires that if carbon dioxide increases global temperature also must increase. This of course is a false prediction during a hiatus and it invalidates the Arrhenius greenhouse theory The only correct theory of greenhouse warming is the Miskolczi greenhouse theory, MGT. It has been known since 2007 but was summarily rejected by IPCC because of its predictions. According to MGT carbon dioxide and water vapor, a greenhouse gas, form a joint optimal absorption window in the infrared whose optical thickness in IR is 1.87. There are two orders of magnitude more of water vapor than there are of carbon dioxide in the atmosphere but the Arrhenius theory completely ignores water vapor. According to MGT, when carbon dioxide is added to the atmosphere it starts to absorb in the IR, just like Arrhenius says. But as soon as this happens, water vapor starts to diminish, rain out, and the original absorption window is restored. Miskolczi showed empirically in 2010 that even if carbon dioxide goes up by 20 percent over a 61-year period the value of the absorption window is maintained within three significant figures. This is what water vapor does, not that imaginary warming assigned to it by IPCC. As a result, Arrhenius, being unaware of water vapor, predicts that infamous “greenhouse warming” when carbon dioxide is added to the atmosphere. What actually happens is that reduction of water vapor has reduced the combined total absorption of carbon dioxide plus water vapor to the point where warming is no longer possible. And that is exactly what we have seen for the last 18-plus years – addition of carbon dioxide to the atmosphere has failed to supply the greenhouse warming that is the life blood of IPCC. February 16th, 2016 The SUPREME COURT sided with SCIENCE against OBAMA! This is an important step forward for jobs. On Feb. 9, the court upheld a delay of Obama’s war on fossil fuels, which is supposed to “stop climate change,” in the form of new restrictions on factories’ greenhouse-gas emissions. Apparently a majority of the court is less confident of the “science around climate change” than Obama is. Amazing. Trouble is the only real validator of these changes, the weather of the planet Earth, has its own ideas. If we do indeed fall into a minimum it’s Game Over for the climate change gang – as people will be too busy trying to keep warm and alive. Also I get the inkling that a lot of those in the political classes are getting cold feet behind closed doors, quite a few cases of Eco lip service down under (ex Eco ministers going on to work in the fossil fuel business etc) – they need to be seen to be on right side of the fence when the publc attention gets shifted. This guy has been declaring “cherry-picked” ever since Monckton’s analysis was published. But it’s quite clear that the start date (about 1998) is determined by the data, so not cherry-picked. 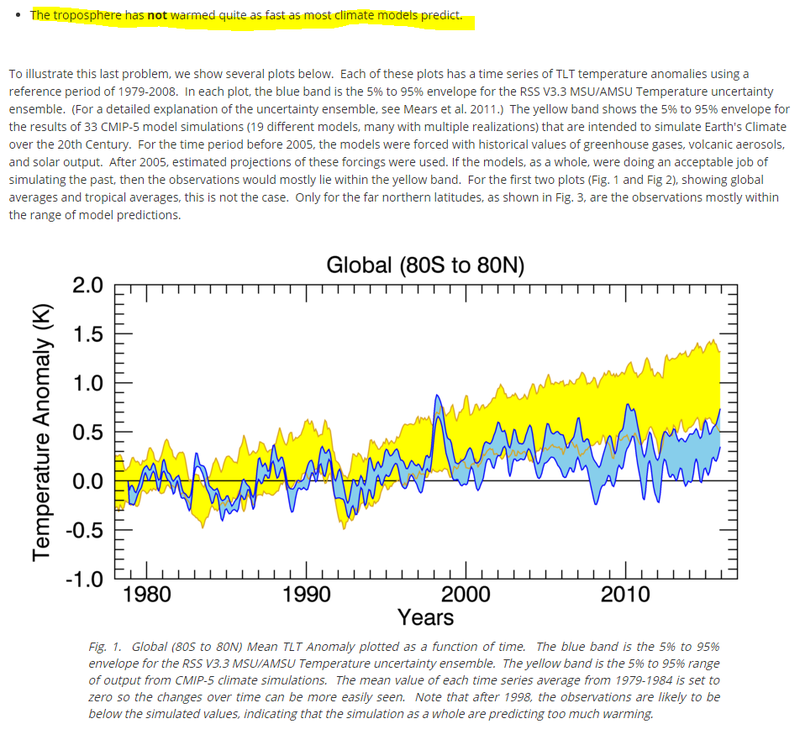 The analysis answers the relevant question “what is the longest current period (i.e., ending with the latest data) for which the trend shows no additonal warming?”. If the longest current trend was a couple of years, it’s wouldn’t have been very relevant. When it’s almost two decades, (and considering that the alarmists began chanting about the warming back in the 80s long before then) it’s informative. Obviously the alarmists have had to come up with dozens of excuses to explain why co2, at its highest, has been having no impact. Well, the current El Nino may diminish that period. However, what goes up, comes down, so watch out for the follow-up La Nina ! With February anomaly for RSS, all trend lines are upwards starting from any point in the record. It’s funny, if consistent, that pause-o-philes are fretting because a statistically non-significant pause has been ‘ended’ by a statistically non-significant warming trend. No doubt we’ll be hearing soon that the new warming trends since 1997/98 fail statistical significance. But where was this interest in statistical significance for the duration of the pause? MIA – because the statistical uncertainty interfered with the whole pause meme. The inconsistency won’t bite, though, because most critics will ignore it. But where was this interest in statistical significance for the duration of the pause? It was discussed here. Where were you? Learning climatology at Hotwhopper? Do you have a link? A proper discussion should have revealed that the uncertainty intervals (particularly the notion in any change from previous trend) scotched the idea of a pause. I’d be interested to see how such discussion went, if that was actually discussed here. You stated somewhere upthread that no scientists believe that there was a ‘pause’ (paraphrasing your comment). I gave you numerous quotes that debunked your claim. You will still ‘Say Anything’ to keep the Narrative going. You can see in the link above that the one and only Michael Mann now admits that global warming stopped for many years. Argue with him if you want. Stealey, it doesn’t matter what anyone other than YOU has said. YOU ARE WRONG time for you to admit your error. I wish governments would impose the same standards on the climate industry as they do on other industries. Governments (European Union) impose ISO 17025 on the industry for determination of the tiniest amount of CO2, while global temperature records are adjusted in ways which would never pass accreditation. How about imposing ISO 17025 on organizations performing measurement and reporting of climate data? It’s such a funny coincidence, that all modern adjustments seem to shift the trend only ever upwards. A casual consideration might lead a person to imagine that errors would be located and adjustments made, on average, equally in both directions. Since an overlooked error or bias, has no specific preference for whether it warms or cools. Surely errors and bias, simply exist, prior to their discovery and suitable correction. (sarc on) Yet no!! This is clearly a mistake assumption. Earlier methods of elucidating the temperature series always resulted in false warming of the past and false cooling of the present. And so, now in the modern era of sophisticated climate science the past can be correctly cooled and the present suitably warmed. Thank goodness for honest climate scientists discovering this remarkable unidirectional bias in all temperature measurement techniques. Everything from land to sea to troposphere. From Argo, to Satellite, to Bucket SST, to Radiosonde. 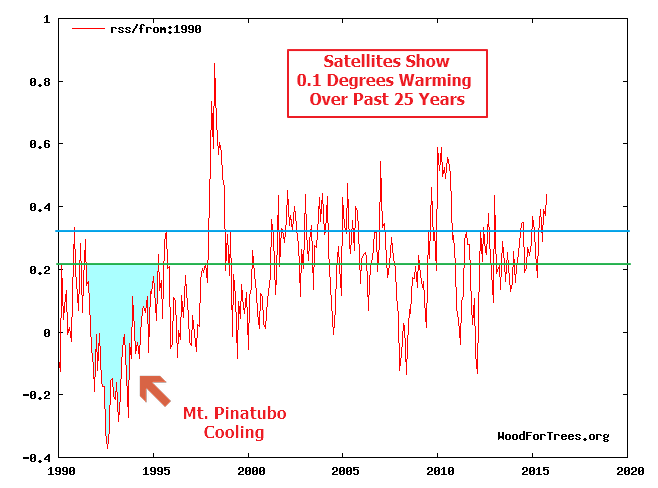 Everything suffered from this perplexing false warming of the past and need to knuckle down and get with the agenda. We are all saved from nasty errant cooling and perplexing pauses. (sarc off). Sadly, this made it to the local newspaper. Pause is cancelled, Ted Cruz is wrong, we really do have a crisis. A brief mention of UAH was made at the end for anyone who reads that far.